You have spent the entire season caring for your soybean crop, hoping to produce the best crop possible. After all the time and inputs spent on the crop, too much is at risk to do a poor job harvesting. Spending a little time on combine efficiency may help increase yields by up to 10%. Studies have shown that soybean field losses are anywhere from 5% to 20% depending on the year. Reducing harvest loss to 3% to 4% could significantly improve profits. The first step in reducing harvest loss is to know how much you are losing and from where so you can make proper adjustments. Types of soybean field losses fall into four categories. To estimate bushels per acre of soybeans lost, you can count the beans remaining in the field after the combine has gone through (or before if you’re estimating preharvest losses). To accurately estimate loss, operate the combine in a normal way to move into the crop well away from the edge of the field. Then stop the combine, disengage and raise the platform, and back up about 20 feet. To estimate loss, count beans in a 10 square foot area and divide by 40 to get an estimate of the bushels per acres lost. To estimate total crop loss, count beans in a 10 square foot area behind the combine. To measure gathering unit loss, count remaining beans in a 10 square foot area in the cut beans in front of the combine. To measure preharvest loss count beans on the ground in a 10 square foot area in standing beans. Shaded areas show where to count beans in a 10 square foot area for total, preharvest, and gathering loss. Image from Sumner (2000). About 4 average size beans per square foot are equivalent to a loss of 1 bushel per acre. Ideally, you should try to keep harvest loss less than 3% (which is about 1.2 bushels per acre in a 40 bushel per acre field). If you find losses are greater than 3%, you may need to make some adjustments to the combine. It is estimated that more than 75% of loss occurs at the header. To reduce these losses, most experts recommend operating reels about 25% faster than ground speed and positioning the reel axis 6 to 12 inches ahead of the cutterbar. Remember, however, the best guide for correct combine settings and adjustments is in your owner’s manual. 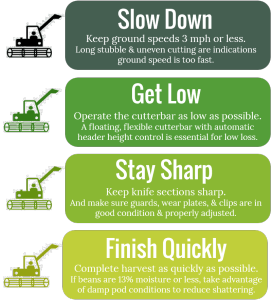 As you begin harvest, keep these four tips in mind to reduce harvest loss. Beasley, E.O. Reduce Soybean Harvest Loss. North Carolina Cooperative Extension. http://ipm.ncsu.edu/soybeans/agronomy/soybean_loss.html. Sumner, P.E. 2000. Harvesting, Drying, and Storage Soybeans. University of Georgia College of Agricultural and Environmental Sciences. http://www.caes.uga.edu/departments/bae/extension/pubs/documents/harvestsoybean.pdf.